It’s been worth the wait! Introducing our very first ICA Lounge exhibition! Liz Steketee: Reconstructed Memories (July 17 – Sept 19). And to make it even more exciting, the space has been transformed into a living room complete with couch, end tables and various and sundry homey accessories to make Liz’s works really come alive and get you in the mood! Stop by. Take a seat on the comfy couch. 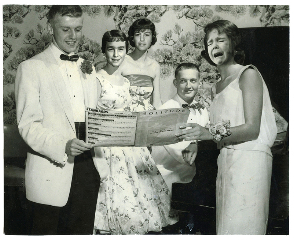 Browse Liz’ s “reconstructed” family photos and see where it takes you. Bound #1 on view in By A Thread – a group show featuring works by artists who use thread as their primary medium. Warning: This blog post is longer than usual, but very much worth the time and effort. Welcome to the inaugural posting for our “In the Lounge” section which is dedicated to promoting and highlighting all of the great stuff available to you for FREE in our overstuffed and underused Lounge/Art Library/Hang Out. You need to know that we/the ICA have an incredible space in the front of the gallery that we call the Lounge. It is filled — floor to ceiling — with art mags that we subscribe to so you don’t have to, artist monographs, exhibition catalogs, how-to art books, periodicals, and postcards and flyers announcing the zillion other art and culture-type shows and happenings in the Bay Area. Oh, and there’s a nice big flat screen tv and a great selection of art videos and programming – but we’ll talk about that later. Back to the books. And who’s supposed to use this so-called Lounge? You and everyone else — check in out, bring your lunch, take a seat, browse the shelves, hang, relax. I t’s FREE and open whenever we are. To get things rolling we’ve made a staff pick from the Lounge shelves. It’s a catalog called linn meyers/here today. First, you need to know that Linn is one of our ’09 artists-in-residence. She just completed her 2-week residency in our Print Center where she created an astounding series of prints that will be on view at our upcoming Monotype Marathon Exhibition (July 1 -18). This catalog offers a wonderful introduction to linn’s work and aesthetic. It chronicles excerpts from an interview with Linn (she’ from DC) by Jefferson Pinder and Lara Langer from the University of Maryland (published by the Art Gallery, University of Maryland). And without going into details about the conversations chronicled in the catalog between Linn, Jefferson and Lara, let’s just say that when you take the time to sit and read this beautifully simple and subtle account of an artist and her work, you will completely get it — Linn, her art, her solid self, her brilliance, and her warm and quiet confidence. Then, when you get up from your seat in the Lounge and walk to the back of the ICA gallery and view Linn’s artwork in the Print Center, you will get it even more. And then, you are hooked. And that’s a good thing. See for yourself. Come to the ICA lounge. Pull this catalog from the shelves. Take a seat. Get immersed. Live a little. I snapped this picture of ICA’s marketing guru Maureen in her cube the other day and I knew it reminded me of something brilliant. Of course! It’s like a “one minute sculpture” by Austrian artist Erwin Wurm. Fortunately we have the beautiful catalogue from his retrospective that was at the Yerba Buena Center for the Arts in our Lounge. Wurm is most famous for his “one minute sculptures” where he provides instructions for models or himself to pose with everyday objects and make an ephemeral sculpture that he documents with photography. The results are suprising and humorous. I am especially fond of the photographs he took at a monastery. The catalogue is filled with the unexpected and definitely worth checking out next time you are in our lounge. The ICA invited artist Travis Meinolf to weave using his portable loom on South First Street during the SubZero festival last June in conjunction with ZERO1. (Btw, check out the ZERO1 Superlight catalogue in our Art Lounge!). If you didn’t see Travis then, check this video made by Michael Goodier that captures Meinolf weaving in public. It is called Social Fabric. How much would you like to stumble on this during your daily walk through a park?